This article will share information about low disk space fixing on Windows Server 2003, 2008, 2012, Windows SBS and Windows Server R2. Download IM-Magic Partition Resizer Server to fix low disk space problem when Windows Server runs out of disk space. If you receive low disk space warning message on Windows Server, partition software is a good choice to fix the problem. IM-Magic Partition Resizer Server is professional partition software with which you resize partition server 2008 diskpart on Windows Server when you get low disk space warning message. By using this partition software, you can extend disk partition, shrink partition and move partition without touching any data on the disk. This partition software is compatible with all Windows Servers including Windows 2003, 2008, 2012, Windows SBS 2003/2008 and Windows Server 2003 R2, Windows Server 2008 R2 and Windows Server 2012 R2. Move the arrows to decrease the size of the selected partition so as to get some unallocated space. You need to move the unallocated space close to the partition that is running on low disk space. 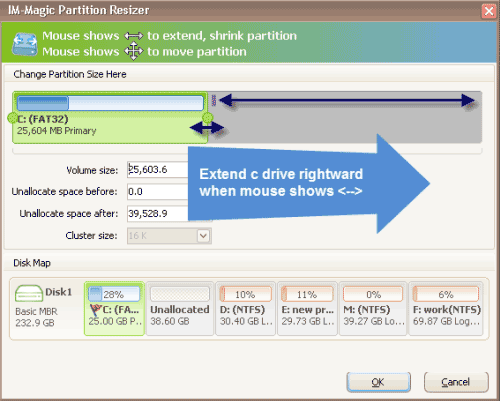 Then, right click the partition which runs out of disk space and choose "Resize/Move" option. Move the arrows to add the unallocated space to the selected partition and then click "Apply" button. "Recently, I frequently get an error message when I boot my computer. It says C drive is running out of disk space and it asks me to delete some unnecessary files to free up disk space. My computer runs under Windows Server 2003 operating system. I tried to uninstall several old programs but system still reports the low disk space warning message. 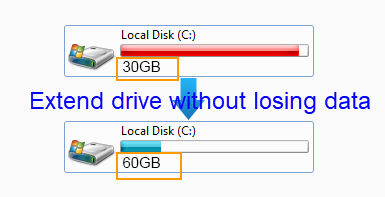 Can anybody tell me how to fix low disk space on C drive on Windows Server 2003?" "I need to resize hard disk on my PC which is running on Windows Server 2012 operating system because the system partition is running on low disk space. Lots of important programs are installed on this partition, so I am wondering if there is any way to resize the hard disk without uninstalling those programs. Thanks for any help!" Traditionally, you may need to backup data, repartition hard disk and reinstall system to resize the hard disk when C drive runs on low disk space. Now, with the IM-Magic Partition Resizer Server, you are able to increase the size of C drive without repartitioning disk or reinstalling system. This partition software provides an easy solution for C drive expanding on Windows Server when it is running on low disk space. By using this partition software, you just need to perform a few mouse clicks so that you can move free space from one partition to another. What you should pay attention to is that you can only move free space on the same hard disk. With this tool, you can even merge unallocated partition c drive server 2003 which is easier and faster to extend the system partition. IM-Magic Partition Resizer Server can help resize hard disk partition without touching any data or rebooting your computer whether the partition you want to resize has NTFS or FAT32 file system, so it is time-saving by using this partition software to fix low disk space problem. You have no need to worry about any system crash or data loss due to partition resizing. Even if your computer reboots automatically due to other reasons during partition resizing, it does not cause any hurt to your computer. If you receive low disk space alert message on system partition, you had better run the partition software to resize hard disk because files stored on system partition are usually very important which cannot be deleted easily. If you receive low disk space warning message on any of data volume, you can move all important data to another storage media or deleting all unnecessary files to free up disk space on the partition. When deleting or moving files from a data volume, you had better be careful to avoid unnecessary data loss. Usually, it is easy to free up disk space by deleting or moving unnecessary files, but it cannot resolve problem thoroughly unless you can delete or move all files from the partition. Otherwise, the free space will be eaten up soon when you write new data to the partition.